Velkopopovický Kozel is a Czech lager produced since 1874. The brewery was founded by František Ringhoffer in Velké Popovice, a town 25 km (15 mi) southeast of Prague. 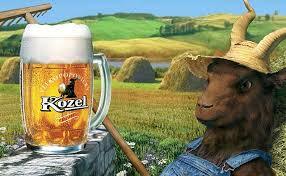 Their symbol is a goat (Kozel means “male goat” in Czech). The company was bought by SABMiller in 2002 and sold to Asahi Breweries in 2016. June 10th they are having their 25th annual Kozel Day – I never heard about the previous 24 and so have no idea how this one will be. The Kozel website doesn’t mention this event. The only details are on their Facebook page. The program looks like a day (09:00 to 21:00) of different Czech bands washed down with plenty of Kozel beer – which I expect will be either free or almost free.